McLeod stormed his way through FP3 and he's right on the pace as he goes into the track at 141.34kts... the splits are in the green... good, clean lines in the first section and the first VTM is on pace and looking snappy as he exits the VTM. We're seeing a much more buoyant McLeod today with greater consistency. He's definitely looking in his element as the splits stay green... he's got Murphy in his sights and another snappy VTM... back around the track and a sprint to the Finish Gate earns McLeod the top spot on the timesheets so far. Czech pilot Kopfstein is up next. He looked a little conservative in his FP3 session but we're seeing a much more aggressive performance from Kopfstein out there today. A little scrappy in the the first VTM, though he's flying penalty free... maybe a bit untidy from the Czech pilot and it could be slightly blustery conditions affecting his pace and racing lines out there today. he pushes to the Finish Gate but the splits are red and Kopfstein can't match McLeod's pace out there today. Juan Velarde up next... he's into the track and looking really quite aggressive but late into Gate 2... the first plsits indiciate he's on pace to take the top spot from McLeod... Velarde looking REALLY focused and on point this afternoon, we're seeing some capable flying but Velarde is really taking it to the limit on this first run with some late rolling... the splits remain green and he's done it! He's taken the first place from McLeod in this first part of Qualifying today. Has the live broadcast of qualifying started? Dolderer goes full throttle from his standing start... 139.63kts and Dolderer is into the State Gate... he takes the long corner around into the chicane and he's looking like he's struggling to find some power from his engine... wings level and no penalties so far but Dolderer is 1.3s off the pace in the second split. 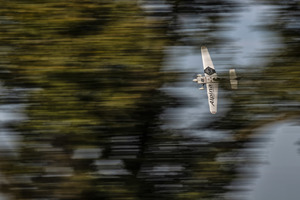 Dolderer pushes really hard in his second VTM but we're seeing him thrashing his way through the track but the plane just doesn't seem to be responding... a clean run and enough to boost him into second place so far but will it be a competitive time overall? We'll just have to wait and find out. Hello, video live stream breaks down constantly! Is there a technical issue? Chambliss into the track at 139kts... he's struggled in the FP sessions and the American's typically aggressive flying doesn't seem to be working out here in the Indianapolis track. The VTM looks low, and he pulls too hard and stalls, losing time with limited chances to catch up again. He's pushing hard but Gate 12 has caught him out, with some over-RPM being reviewed. Chambliss currently in 6th place overall. Brageot flies through the Start Gate, he's got 141kts and it's a storming start but a gust of wind threatens to push him off his racing lines... it's a pushy run and this is not the calm and smooth flying we're used to seeing from the French pilot. An early roll into the gate and he's on the back foot throughout this run. Not his best performance but he's got time to recollect and refocus for another run later on today. Muroya up next... he pushes his way into the first gates but at Gate 5 we see +1s in penalty for an incorrect VTM.. Muroya is flying with new wingtips and has finished consistently in the top half of the timesheets so far this week... but hseems to be losing his pace and the buzzer goes again at Gate 11! Muroya picking up +3s so far and it appears the flying conditions could really be putting the pilots under pressure in a track that requires super focus and precision. The buzzer goes yet again and it's another penalty for Muroya, that's +5s in total! Goulian cleared into the track. Goulian is chasing a World Champion title and Indianapolis is a race that he cannot afford to mess up this weekend... the American dialed in for the first Free practice sessions but we're seeing a much more conservative Goulian out there at the moment. No penalties, but no real pace as Goulian puts in a safe performance. Perhaps a banker as he prepares to go harder and faster in his second run later. Goulian sitting in third place overall so far but there's much more to come. Australia's Matt Hall cleared into the track... he's through the Start Gate at 143kts and it's a solid start... Hall looking composed and we're not seeing many corrections so he seems to be working with the blustery conditions... Hall picking up his pace but the blistering pace that we often see from the Australian just isn't there yet. Through the back side of the track and Hall is focused and looking very comfortable... it's a bit of a safe flight from Hall and he knows there's more in the tank as he finishes up in second place overall so far, just 1.168s slower than Velarde. Sonka is the last pilot to take his first run in the track... he's started to look unbeatable in this second half of the season and the Czech pilot is looking more aggressive than Hall... he's making it look almost easy as he lines up for the second VTM... a small correction but it's textbook Sonka as he blasts his way through the track to the Finish Gate... he's done it! He's pushed Velarde off the top spot in this first pass in the track with a significant margin of 0.475s faster. Looks like Sonka is sending a message loud and clear to the rest of the pilots - he's ready to take that Championship win. Bolton finished in 12th after his first run so we'll need to see more pace and a less conservative run now... it's looking more promising for the Chilean pilot. he's penalty free so far and Bolton is looking harder and giving it much more punch as he takes on the second VTM... great lines, more aggression, more bite and the confidence is really picking up in this second half of the track. Bolton shoots up the timesheets into 6th place overall so far with that penalty-free performance. Standing start and he's into the Start Gate at 139.57kts... he's got to find a good couple of seconds in the track and we're already seeing him respond... a great tight, turn there and he's really tidied up his performance. More energy from Ivanoff and he's looking almost poetic out there as we see precise and tactical flying, a little on the edge but it all looks penalty-free as he storms his way to a personal best... and up into third place overall so far! ben Murphy cleared into the track. He's through the Start Gate at 143.28kts and a little more aggressive from the British pilot. First splits are in he's just 0.2s off Sonka's pace... the first VTM is tidy but he's drifted a little off the line and immediately we see Sonka's margin increase as Murphy falls behind by over a second and a half... and the buzzer goes! Murphy picks up +2s for climbing in the gate at Gate 12. A late disappointment for Murphy, who can't go any better than 9th place overall now and it'll pitch him in a very difficult head to head heat tomorrow. McLeod took a first place finish in FP3, but he's looking a little more collected this week and there could be good things to come from the Canadian pilot this week. He's error free so far and looking precise, a few pitches to sort out in the VTMs but on the whole McLeod is holding it together, the pace is good and it's a solid precursor to a competitive performance tomorrow on Race Day. Kopfstein had a promising start to the week but has struggled in the last flying session... Kopfstein into the track at 143kts... it's a solid pace but the first VTM is on the slower side.... Kopfstein still looking a little conservative and we're not seeing a comfortable pilot right now... second VTM and he pulls too hard whilst rolling and that's a costly stall... the time adds up and Kopfstein now on the backfoot. He's through penalty free but there's no real pace there. Kopfstein finishes up in 11th so far overall and it's a frustrating finish to Qualifying Day for the Czech pilot. Velarde up next. He's got speed but now that the wind conditions have picked up can he match his Run 1 pace? Velarde not looking so focused this time around... the Spanish pilot needs consistency and we're not seeing that right now. An early roll and that's a penalty for an incorrect VTM, and another penalty at Gate 15 for incorrect level flying... despite an extra +3s on teh clock Velarde takes his Run 1 time of 1:05.226 and maintains his second place overall. Dolderer is always a threat for the podium... but we've not seen the top level performance from the German that we know he's capable of. First VTM and a slight correction but it makes a huge difference and Dolderer loses some time... it seems the second VTM is also possibly costing him some time and we're not seeing happy, aggressive and fun flying from the German pilot. He seems to perform well when he's enjoying racing and Dolderer doesn't look too impressed out there right now. Dolderer stays in 5th place overall so far. Le Vot cleared into the track and seems to be battling some strong gusts in the racetrack right now... a slight drift but Le Vot is battling hard now, a little too aggressive in the VTM but he's picking up the pace and looks to be on track for a better result than Run 1. No penalties despite the gusty conditions, but it's only enough to place the French pilot in 10th place overall so farar. Chambliss landed a DQ result in Run 1 so he'll need to absolutely keep it clean for this Run now... Chambliss in at 138kts and that's slower than many of the pilots today. He's struggling to find competitive speed out there, second VTM looks to be OK but Gate 16 catches the American pilot out as he picks up +2s. That's a real disappointment for Chambliss at the first of his two home races this year. Chambliss in 13th place overall so far. Mika Brageot up next... he's into the track at 141kts... he's looking really aggressive again and Brageot appears to have adopted a flying on the edge approach as he nails the first VTM.... more aggressive flying but a little slip in focus in the second VTM and it's another costly mistake for the French pilot, who is doing everything he can to get out of the danger zone in the Race Day heats. it's quicker than his first run but it's not enough to elevate him above 10th place overall so far today. Muroya lingering at the bottom of the timesheets as he enters the track for his second run... a much more refined performance from Muroya... smooth and fast, he's found his form again and great VTMs... he's back in the chase as he goes full throttle through the second VTM... aggressive but on the right side of energised from the Japanese pilot. Pace, pace, pace, he's flying up the timesheets from 14th to 4th and Muroya has raised his game in time for Race Day. Goulian's first run placed him in 8th overall. But we know that the American pilot doesn't panic and he's looking smooth and clean... he's got his lines but they don't look particularly quick and Goulian is lacking a bit here in Indy. We've seen much better from the World Champion contender... the cross wind looks to be putting Goulian off his pace and the buzzer goes as he drifts off angle and picks up +2s at Gate 18. That's a really dangerous situation in terms of results and Race Day heats for the American... it'll be a nail biting Round of 14 for Team Goulian. Hall goes full throttle into the track... 141kts through the Start Gate... it looks quick but we're not seeing the eye-popping pace that Sonka had in his run... Hall nails the first VTM... the times are looking promising and Hall has got great control through the track as he heads into the second VTM. Controlled and on point, Hall battles a little with the drift at Gate 18, and made it cleanly through the last Gate.